If you knew then what you know now…would you still do it? Absolutely, because I love what I do. No two days are ever the same and it’s exciting to be able to watch the brand grow. My uncle ran an enormous FTSE 100 company and he said that people never change; if employees aren’t right when they first start, they never will be. That’s something that has stuck with me and it has always turned out to be true but it’s human nature to just carry on to avoid the conflict. After a trip to the United States, I designed a product which became one of the biggest selling car accessories for a decade. The Richbrook Aluminum Tax Disc Holder was unique, functional and a stylish alternative to the plastic tax disc holder. Unfortunately, they scrapped tax discs which put a sudden stop to that one! Luckily enough for me I am yet to hear one about myself…! Kids, cars and nice-looking things! 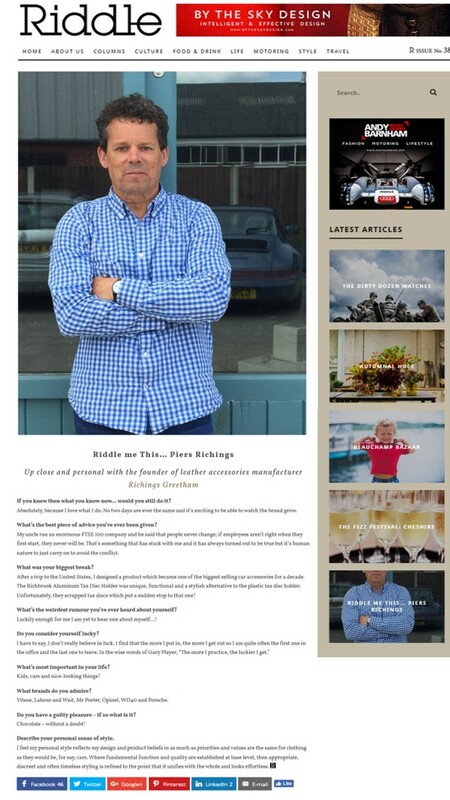 Vitsoe, Labour and Wait, Mr Porter, Opinel, WD40 and Porsche. Chocolate – without a doubt! I feel my personal style reflects my design and product beliefs in as much as priorities and values are the same for clothing as they would be, for say, cars. Where fundamental function and quality are established at base level, then appropriate, discreet and often timeless styling is refined to the point that it unifies with the whole and looks effortless.